The UK government, like governments in most developed countries, spends a lot of money on public services i.e. defence, law and order, transport, education, healthcare and protecting the environment. We don't need to argue the merits of these things (they are to some extent 'necessary evils'), the fact that every developed country does this to a greater or lesser degree gives us a clue that a country that didn't do so would fall behind or even fail. Politically, nearly everybody is in favour of the government doing these things in some form. In a democratic society, a government that skimped too much would be voted out of office. If a dictatorship or Communist country skimped too much, there would ultimately be a revolution or an invasion by a stronger neighbour. b) make land in some areas more desirable. Think catchment areas of good state schools or business hubs in areas with the best universities (Oxford, Cambridge, London); areas with an unspoiled view; areas with good transport links or cheap/good public transport. There are second order effects as well. The government can only do baseline stuff which enables capitalism and the free markets to thrive. Mass education makes it easier for businesses to succeed without having to pay (directly) for their employees' basic skills; the road system enables people to get to work and goods to be transported; so 'high achievers' sit on top of a pyramid of state-educated workers who arrived by road or public transport, and 'high achievers' buy homes in the nicest areas (pushing up prices of the land in those areas). Businesses tend to concentrate themselves geographically (shops in the town centre; banks in the City of London; manufacturing in the Midlands) and the places with the most successful businesses have the highest prices and rents. Governments don't have any money of their own, so they have to collect taxes (or else the spending would lead to hyper-inflation). At present, in the UK (as in most countries), the bulk of taxes are collected from private sector output and employment. Although superficially, public services are supposed to benefit everybody and the whole economy, ultimately, all the spending (apart from pure corruption and waste) goes into higher land values. However much you earn and however much tax you pay, if you want to get something back from our civilised society you have to buy or rent a home (or business premises) somewhere. Try being homeless for a while and see what the government will do for you - pretty much nothing. The price or rent you pay is merely paying for your share in the civilised society that you actually already paid for in taxes. So people who buy or rent a home are paying twice over. On the other side are the landowners (landlords or people selling a home or business premises). The value of their land is sustained by government spending (which the productive economy is forced to pay for in taxes). So they are renting out or selling something which everybody but them paid for (private landlords in the UK collect twice as much in Housing Benefit as they pay in income tax). So the system is rigged, it is a massive ongoing transfer of wealth from the productive economy to landowners. (Clearly, there are a lot of working age, owner-occupier households; they are being bribed with their own money - they complain about the taxes they pay but celebrate increases in house prices). It seems much fairer to pay for public services with a straightforward service charge proportional to the value of the benefits which each plot of land receives, i.e. a Land Value Tax. We don't even need to call it 'Land Value Tax', we can call it 'Public Services Tax', and break down tax bills into X% for law and order, Y% for road maintenance and public transport, Z% for education etc. a) Many Christians (and people from other religions) take it as given that G-d created the whole of nature - air, land, sunshine, fresh water and the seas, plants, animals and minerals - for the benefit of the whole of mankind, and it is the gift which keeps giving as to a large extent it renews itself and is an endless source. Air is the one thing which has never been privatised and nobody has to pay anybody else for the simple act of breathing. Most of the world's oceans are international waters and anybody can sail across them or catch fish at will. Fresh water, plants and animals are an intermediate case. Although He (or She, I am entirely agnostic) provides all the raw materials (rain, wild plants and wild animals) it is a lot of work to capture the rain water, to refine in and pipe it or transport it to where it is needed; it is a lot of work breeding and growing plants and animals. But although rain falls from the sky, you need large areas of land to collect it (in reservoirs or from aquifers), and even if everybody were given free seeds and animals, they would still need land for them to grow or graze on. So the net benefit of all of nature boils down to land, and if He or She created it for all of us, what right do a minority have to declare themselves owners of a disproportionate share? And as physical land can never be divided equally (in the same way as everybody always has enough air to breathe) the only way of dealing with this is to everybody to pay into a common fund for what he occupies and for everybody to share in that common fund (directly or indirectly). The atheist's or economist's approach is far simpler and focuses primarily on the rental value of urban land (there are lots of other government protected/created or natural monopolies to which the same logic applies). Remember that the total rental value of all farmland reflects agriculture's share of total GDP, which in the UK is only one or two per cent. So although an average farm occupies one or two hundred acres, the rental value of all that land is little more than the rental value of an average home in an urban area. If we know how that rental value of urban land ("location, location, location") arises and who creates it, then that gives us a clue as to who it "belongs" to. a) The first condition is a stable and law-abiding society (try buying, owning or renting land in Haiti, Afghanistan or Somalia, for example), and clearly, rental values are lower in high crime areas than in low crime areas. So every law-abiding citizen is contributing to the rental value of land. b) Next you need the right to exclusive possession of certain bits of land (for living on or for carrying out a business). The exclusive possession is important (again, without that land has no market rental value). And it is the whole of society which underpins that exclusive possession and protects each occupant against trespassers or foreign powers. c) So the exclusive possession is important, but there is no natural reason why the rest of society should give away that valuable right for free so that private individuals can occupy, rent or sell it for private profit. d) Only when you have a stable state can people be declared legal owners of land in the first place (with or without paying for it), the other party to the agreement is always the whole of society. e) Then you need an economy which provides more than 'subsistence level' and all Western economies do this many times over. In the short term, all growth in the economy above and beyond subsistence level goes into higher rents and higher land values. What prevents all growth going into higher rents in the medium or long term is the fact that people's expectations of a 'basic minimum' standard of living (i.e. that which they will spend their money on first before spending anything on land rent) increase nearly as quickly as the economy grows. f) The economy depends on people specialising and trading with each other. So the more easily people can trade with each other, the more they can specialise and so on. This can be achieved by people simply living closer together and nearer their places of work (and the places where they like to spend their money!) or by having better infrastructure (mainly road and rail, but also telephone and internet access). The two go hand in hand; it makes more sense to build infrastructure where people are already close together (it's simply far cheaper to install internet cabling for a hundred flats in a few blocks on one road than it is to connect up a hundred scattered farm house in several different hamlets which could be miles apart). g) As it happens, most infrastructure is paid for by society as a whole via its taxes, and there are lots of other things which the government provides which the whole of society pays for. Some of these are core functions of the state (law and order, defence, roads); some are public goods (refuse collection, public health) and some are just merit goods which Western governments appear to be involved in by default (parks, education and healthcare). The rental value of most urban land depends to a large extent on benefits provided by the government directly and paid for by the whole of society. h) From City AM, "A meta-analysis found a doubling of urban population raises productivity about 6 per cent. So someone going from a town of 50,000 to a city of 800,000 raises their productivity 25 per cent – and vice versa." So it is a virtuous circle. People like to move to larger towns because wages are better, and when they move there, there are more people, so productivity goes up a bit more, drawing more people in and so on ("agglomeration"). i) Problem is that all this extra growth goes straight into higher land values and rents, which are siphoned off by a class which is not contributing anything. Owner-occupiers who are working are wearing two hats here, they are simultaneously being robbed and robbing from others. The fact that this cancels out does not justify it. Remember again that the 'bare minimum' living standard of people in high income/productive areas is no higher than in low income/less productive areas in the same country. Bearing all this in mind, can it really be right that land owners (from the largest to the smallest, and including indirect landowners, i.e. the banks who collect land rents via mortgage lending) are allowed to enjoy or collect all this rental value for little or no payment, even though it is clearly the whole of society which creates rental values - whether directly or indirectly, whether through their own presence, the work they do or the taxes they have deducted from their earnings? j) Even if you put "dead weight costs" to one side, taxing incomes is clearly immoral as it is taking away personal property for nothing in return. A tax on land values is merely a user charge and largely voluntary - if you want to live in a nice house, you pay more, and in return for that payment you get a direct tangible benefit in return, which you would have to pay for anyway, with or without LVT. So if it is acceptable for private landowners to collect land rents, it is more than acceptable for "society as a whole" to collect those rents. The current tax system just boils down to welfare for the wealthy, paid for by taxes on the middle (who also have to pay for welfare for those at the bottom). 4. Pragmatic arguments in favour of LVT i.e. "it's less bad than taxes on earnings and output"
Whether you like it or not, most Western governments are committed to collecting between a third and half of GDP in taxes, if we take that as given, why not collect taxes in the way that damages the economy least? a) The purely moral argument that taxation of earnings is theft and acts as a punishment for working harder or cleverer. Taxation of land rents is not theft as it is merely a user charge for benefits received. And even if taxation of land rents is theft, so what? Land ownership is also legalised theft, so make the punishment fit the crime. It's like when the police confiscate the proceeds of crime - that money doesn't belong to the police either, but it certainly doesn't belong to the criminals. b) There are massive administrative, compliance and enforcement costs associated with assessing and collecting all these taxes (or withdrawing welfare payments), which amount to a few of per cent of GDP. The costs of assessing (and appealing against) taxes on land values are negligible in comparison. 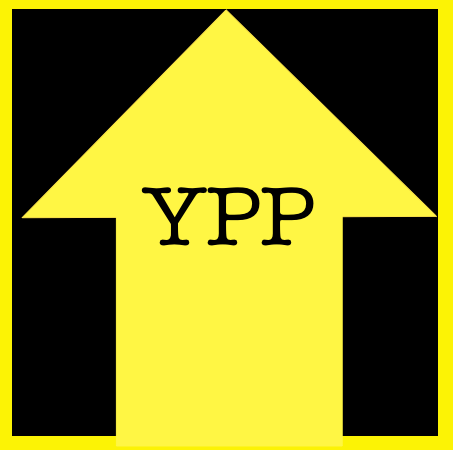 No system of valuation will ever be hyper-scientifically provably accurate for each individual plot of land to several significant figures (because there are different ways of establishing site premiums and none is perfect), but most plots can be valued to within a couple of per cent either way for a few pounds a year, and collection/enforcement is easy. c) The other argument is that the five main ways of taxing earnings and output (VAT, National Insurance, income tax and corporation tax, means testing of welfare payments) have huge deadweight costs. Deadweight costs are economic output which are lost because economic activity simply does not happen in the first place, i.e. a business which would be viable if sales taxes were lower is no longer viable and never gets off the ground; somebody who could earn (extra) money sees no reason to get a job or do overtime because it makes him no better off. The average overall tax rate on earnings and output in the UK is about fifty percent, but there are plenty of people who face rates of closer to one hundred per cent. There is no official estimate for the deadweight costs of taxing earnings and output, but from what real life data is available, it appears to be the tax rate to the power of three, in other words, if the effective overall tax rate is 80%, the deadweight cost is 0.8 x 0.8 x 0.8 = 51% (the economy runs at half its potential). If the effective overall tax rate is 50%, then the deadweight cost is 0.5 x 0.5 x 0.5 = 12%, which is an improvement on losing half. that still represents a reduction in the size of the UK economy of £200 billion a year (£7,000 per household!). Assuming the "tax rate to the power of three" rule of thumb holds, it is only when you get the overall tax rate on earned income down to 20% or so that the deadweight losses are insignificant (0.2 x 0.2 x 0.2 < 1%), any higher than that and the vicious circle starts again. LVT on the other hand has no economic deadweight costs, and if anything it stimulates economic activity, see outcomes". d) It is far simpler and cheaper for a government to collect taxes from land than to try and tax incomes. The government is the ultimate arbiter on who owns each bit of land (there is no such thing as private and competing land registries), so it knows exactly who owns what. All it needs to do is work out relative land values and send out the bills; these are secured on the land and so collection rates are very high. The only loopholes would be ones which the government deliberately introduces. As soon as you start trying to tax incomes, turnover, output, profits, employment etc, you have to start introducing more and more rules to say exactly what deductions can be made from income, what counts as turnover (trickier than it looks), which kinds of output are VAT-able and which aren't, how profits are to be calculated, what counts as employment and what counts as self-employment. And you need all manner of rules on how to decide whether a certain item is subject to UK tax or whether it took place abroad, and on which "foreign" things are subject to UK tax and which aren't. The tax office is then split into several different departments, one for each specific tax and businesses have to comply with running three or four parallel systems to calculate all the different liabilities and pay clever accountants shed loads of money to try and keep these to a minimum. 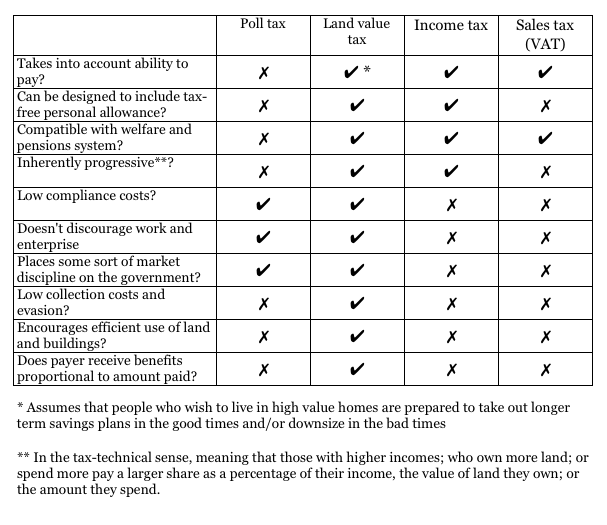 e) Taxes on land value are the opposite of a stealth tax, they are an in-your-face tax. Most people don't have a clue about how much tax they are actually paying; they might have a vague idea about how much income tax they pay, but income tax only raises about a quarter of all government revenues. If people actually knew how much tax they are paying, there would be more pressure on the government to try and justify it by spending it more sensibly on things which people actually support, failing that to simply collect less in the first place by increasing the personal allowance. f) Current landowners will bleat loudest about LVT, claiming it would make them worse off (which it might do, if they own lots of land and have little earned income). Most of them would be better off anyway, but taking all current and future landowners together, the LVT has no impact on them at all. The current owner's loss is the next owner's gain. The same cannot be said for taxes on income. They are a burden on today's earners and will be the same burden on tomorrow's earners ad infinitum. 5. LVT leads to much better outcomes than the current system of taxing earnings and output. Some people will not consider that the moral arguments themselves justify a tax shift, and the arguments against taxing incomes hold whether you believe in taxing the rental value of land or not. The point is that collecting the rental value of land for national purposes (and not taxing earned incomes) leads to better outcomes than taxing neither rents nor earned incomes. There is a sliding scale where at one end only earned income is taxed and at the other only rents are taxed, preferably at 100%. Clearly, even a system of taxing earned income inadvertently taxes rents to some degree because every £1 paid in income tax reduces the rent which earners can pay and the rental income collected by banks and bankers as interest is liable to corporation tax and PAYE etc. a) The economy is plagued by regularly recurring financial recessions, all of which are caused by credit bubbles and asset price bubbles, the largest and most damaging of which is in land prices. Taxing land values provably keeps them low and stable - during the 1950s and 1960s, house prices were low and stable for a number of reasons, not least of which is the fact that we had Domestic Rates and Schedule A taxation, which between them were a crude form of LVT. Other reasons for price stability were proper regulation of building society lending, lots of new construction for private purchase and of social housing and rent controls and high taxes on rental income. b) Unemployment will fall significantly. It is estimated that each 1% increase in VAT means that about 100,000 productive jobs are lost. The other main taxes (income tax, National Insurance, corporation tax) are not quite as damaging, but getting the overall average marginal rate down from 50% to 20% will enable the private sector to create the equivalent of four or five million new full-time jobs. There is a lot of correlation between unemployment and crime (the unemployed have less to lose from turning to crime; criminals who want to "go straight" find it hard to get a job) so the fall in unemployment will be matched by a fall in crime (however small). c) All sites which can be profitably be put to use will be put to use instead of being left vacant or derelict, so commute times will be shorter (inner urban land will be developed before green field sites are built on). d) Instead of a lot of people doing nothing except sit back and collect or enjoy land rents from the productive economy (whether as owner-occupiers, landlords or bankers), everybody will have to contribute to the real economy if they want more than a very basic standard of living. So there will be more people producing more goods and services. The economy will grow. i) The price bubble for commercial land and buildings was much smaller and shorter-lived than in house prices (see here). ii) The UK government reduced the generosity of rates relief for vacant business premises in 2008, and even though the recession was just starting, the occupation rate for business premises went up slightly. Faced with a tax bill which was payable whether their premises were occupied or not, some landlords made the simple calculation that there was no point holding out for higher rents any more and dropped their rents to a market clearing price. f) LVT will lead to fuller use of existing land and buildings. We do not have a physical shortage of housing in the UK, there's enough for one bedroom each - the problem is that it is woefully badly allocated. It is quite clearly the case that tenants do not want to pay rent for anything more than they really want to use - nobody pays 52 weeks rent a year for a second home which they only intend to use for a few weeks a year, there are no Poor Widows who continue renting a large family home with several spare bedrooms just for sentimental reasons. So faced with having to pay LVT every year, everybody - not just young tenants and first time buyers on very tight budgets - will be encouraged to make more optimal choices about whether they really need to live in that house in that area. i) Between generations. Today's pensioners could save up a deposit within a year or two when they bought their houses and pay off their mortgage in ten years; those who bought in the early 1980s or the mid-1990s could do the same. People who bought at other times (early 1970s or late 1980s) were not so lucky but people in their twenties or thirties today are being completely sold down the river. ii) Between North and South. Economic activity in marginal areas is choked off by taxes (and regulations). Under LVT, the tax payable in marginal areas would be more or less nothing (or negative), if that doesn't get them going again, then nothing will. And we will get away from a situation where the government's entire economic policy seems to be focussed on propping up land prices in the most expensive areas (London and the South East) at the expense of everything and everybody else. iii) Between sectors. The usual suspects - banks and landowners - have manipulated the tax code so that they pay a lot less tax than productive industries (primarily the VAT exemption) and of course they are just collecting rent and interest from the productive economy. So far too many people are trying to go into banking or land speculation. Knock the private rent collection on the head and reduce the taxes on the productive sector and you'll find that it's doing much better. iv) Between rich and poor. The apparent wealth divide has little or nothing to do with people's natural abilities or willingness to work and earn money -and reducing taxes on incomes might well increase the differential in people's net incomes. The wealth divide has nearly everything to do with those at the top collecting rent and interest from everybody else and making land-related capital gains at everybody else's expense. By definition, this divide can only get more extreme over time - the harder the people at the bottom work, the more wealth flows upwards. h) LVT leads to better government decision making, as the government will be acting like a landlord and will focus on things which really add value. If some government action (be it infrastructure spending, increasing police numbers or extending the opening hours of a local library) really benefits people, then it will be self-financing. The increase in rental values and hence LVT receipts will more than cover the cost and a real profit has been made, which can be used to reduce taxes on income or to increase personal allowances, pay off the national debt etc according to taste. i) A good example of collecting revenues in exchange for granting government-protected monopolies is the auctions of radio spectrum. The fact is, those exclusive licences have huge value. The government would be idiotic to just give them away, or else the first companies to be granted a licence could just sell them on for a profit of billions without lifting a finger. When calculating their auction bids, the telecoms companies made estimates of revenues and deducted estimates of costs and the balancing figure is pure monopoly profit or rent. However much they paid for the licences does not increase the prices they charge by one penny or reduce the amount they spent on satellites and computers by one penny - as they had already added their prices to and deducted their costs from the amount they were prepared to pay for the licence. j) Another good example is North Sea oil taxation and mining permits and licences. The oil is just there, the price of oil is what it is, the oil companies subtract their expected costs from expected revenues and are perfectly happy to pay the balancing figure for the licence to extract. An oil company which does not wish to use its licence can sell on the licence to a third party for its market value and nobody bats an eyelid, why should it be any different when the government grants the first licence? k) Fuel duty is not really a tax on petrol or a tax on pollution at all, it is a very simple but effective road user charge. What you are paying for is not the fuel itself, what you are paying for is the right to drive a certain number of miles over public roads. Fuel duty is rent for roads. If it were scrapped then pump prices would halve, there'd be fifty per cent more cars on the road and the country would descend into complete gridlock. So while haulage companies complain about the cost of diesel, it would probably be the case that if we halved diesel and petrol prices, the extra costs of having twice as many lorries on the road with twice as many drivers travelling at half the speed means that their profits are completely wiped out.